Keep Mirrorless among your considerations as many vintage lenses can be easily adapted to them. This may help on your budget. Nice, Stan. So is that Chicago or Vermont landscape silhouetted by the night sky? Nice picture Stan. Looks like a nice place to be. I hope to get some milkyway pictures this summer. Bob, I took that image in Tucson in the Saguora desert close to the Mexican border. 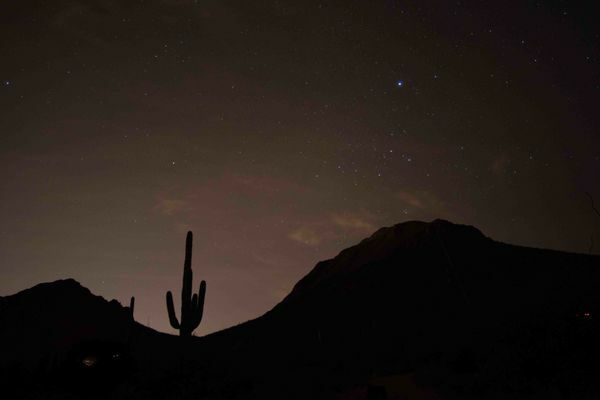 The light you see over the mountains was light pollution from Tucson. Stan, I figured as much. I knew it had to be within Az. Just a bit of fun, evidenced by the smilie after my name. Welcome ASCET3. If you are interested in landscape astrophotography I think you will find these sites very useful. Your budget is a bit on the low side for a top of the line astro outfit but I have been very pleased with this set-up which would be right on the money for you. This is an APS-C (crop) set up. Full frame cameras are best for this type of work, but $1000 barely buy you a decent used FF body. If you can go extra money, there are many here would recommend putting the extra into the tripod. Add in an intervalometer for the change left out of $1000. For Milky Way shots get the PhotoPills app for your phone. You should also need a small flashlight with a red filter. If you're really serious about getting into astrophotography and nightscape photography, save up your dollars and buy a Sony A7S (not the II). It has phenomenal low light performance, is full frame and, with adapters, can mount almost any lens or telescope in existence. If you get into astrophotography, you'll probably want to modify your camera to full spectrum. An A7S is easily modded and does a good job of capturing the Ha spectrum from emission nebulas, as well as everything else. A full spectrum camera can also be used with IR Pass filters for IR photography. Look into the Fujifilm cameras. You’ll get much more bang for your buck over Sony. I have been to Vermont a few times. I have never seen any cactus in my travels. I'm guessing it's Chicago.